When you are planning to move the site running with SQL from one hosting server to another. SQL database backed up to a special blank cldb.mdb MS Access database, which may be further downloaded and stored at a local computer or moved to other site for further restore to another SQL database. Download for v3.2 at "Premium Download Page"
May 12 2007 - Version 2.1 released. Reflects changes in database structure after Option + Advanced search upgrade installation. Backward compatible with v3.2 package enhanced by any currently released plug-ins. December 13 2006 - Version 2.0 Released. Substitution for any old release previously included with main distribution package of RC v3.2. -More robust interface, which is backward compatible with any RC v3.2 installation regardless of installed plug-ins developed prior to the Conversion Tools release date. -Backup/restore is now under the same page with GUI interface. -Password protected for more security with option to rename the main utility page for more security. -Direct links to conversion interface from Global Management admin page. 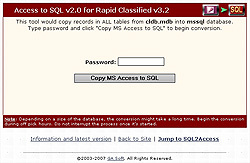 -Web site Moving Guide for Rapid Classified running with MySQL/MSSQL. Online Classified Ads Software solution for your online business. Build Online Classified Ads System in minutes. ©2003-2019 GA Soft. All Rights Reserved. No content of this site may be duplicated without written consent of GA Soft.